The present study examines Chinese university students’ attitudes and knowledge regarding energy, specifically towards forest bio-energy in their country. The study was based on opinions of students from Northwest Agriculture and Forestry University (NWAFU) in China and it was conducted using a questionnaire completed by 441 students. The students’ attitudes are seen as highly relevant because they are considered as both potential consumers and possible experts in the field of bio-energy. Their activities influence how the future energy markets will likely develop. The results revealed various interesting facets of the students’ views regarding energy usage. Of particular interest is the students’ positive attitude towards renewable energy in general, but slightly less positive towards forest bio-energy. However, the respondents expected to receive more information and knowledge about renewable energy and forest bio-energy. Moreover, it can be concluded that the dissemination of knowledge through different sources (e.g. teaching in school, information available on the Internet and other media channels) is an increasingly important aspect regarding energy issues. 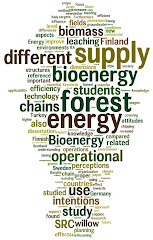 The results of this study can provide information of the perceptions of young educated people on energy policy issues and thus serve political decision-making processes for the future options concerning the development of forest bio-energy in China. Finally, the outcome of this study indicates that further environmental and energy education in China is urgently needed.